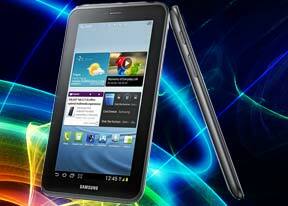 A 3.15 megapixel main camera capable of doing 720p videos and a VGA front-facing camera is what you get with the Samsung Galaxy Tab 2 7.0. Given that tablets aren't the most photography-friendly devices, it's probably as much as you are going to need anyway. The two cameras are mostly there to cater for video-chatting and augmented reality apps, as well as the convenience of snapping a label or two as a memory aid. The camera interface is an oversized version of what you find on the Galaxy line of smartphones, with the available settings on the left and the shutter key and the video/stills switch on the right. We've got a few samples to demonstrate the image quality of the Galaxy Tab 2 7.0 camera. Surprisingly, it is on a really high level. The 3 megapixel camera resolves lots of detail and even though the dynamic range is not that great, frequently resulting in blown highlights, the noise levels are pretty low even in low light situations. Overall, the Galaxy Tab 2 7.0 has a nice snapper on its back - more than fit to do its purpose. The camcorder interface is not much different, really. There are fewer options available here, but the layout is basically the same. The Galaxy Tab 2 7.0 is capable of recording 720p videos. The 720p videos are top-notch with stereo audio recording, full of detail, low in noise and, generally, nice and smooth. Check out the 720p sample that we captured with the Galaxy Tab 2 7.0. And here goes a 720p video sample from the slate that we uploaded to YouTube. The entry-level Samsung Galaxy Tab 2 7.0 kicks the connectivity suite off with a/b/g/n Wi-Fi support, with both 2.4GHz and 5GHz band compatibility. Wi-Fi Direct and DLNA support are also available. There is a microSD card slot as well, on top of the 8/16/32GB of internal storage. Naturally, Samsung Galaxy Tab 2 7.0 supports USB-on-the-go, but you will need to buy an adapter for that (the original connectivity kit with 2 adapters - SD reader and USB port - costs $25). With that you can connect card readers, USB flash drives and other compatible devices to your tablet and access their contents through the file manager. Mice and keyboards are supported as well. But for tablets Bluetooth peripherals are usually the better option. There's no NFC connectivity on the Galaxy Tab 2 7.0, though. The tabs are kept in a bar on top, much like on a desktop browser. The address bar and search bar are incorporated in a single field - typical Android - which scores another point for the Galaxy Tab 2 7.0. Bookmarks and History have their own screen with a split-screen interface. In History you can check the pages browsed today, yesterday or over the past week. There's also a most visited and today tabs. A neat feature allows you to access quick page controls (back, forward, refresh, bookmark etc.) by a swiping gesture performed near the right edge of the screen. As for the Flash performance - the Galaxy Tab 2 7.0 does great at 360p, 480p and 720p videos right in the browser. Flash games run well too.